As our winter indoor life begins to move outdoors with the changing season, we’ve often noticed our home accumulates dust. Even though windows are propped open during the day, I can’t help feeling that our air could be a lot cleaner. We’re also lucky enough to have a wood-burning fireplace, something else that gradually adds particulate matter into the air. Next to the Supersonic hair dryer, Dyson’s Pure Hot+Cool Link is one of the UK-based brand’s newer products, meant to “intelligently” purify your space while adding heat and airco to boot. 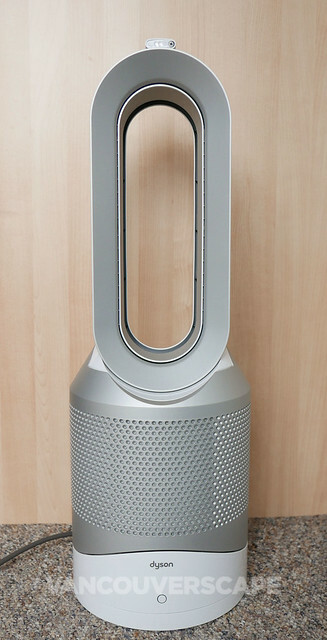 We’ve owned a Dyson Hot+Cool for years and the product effortlessly keeps us comfortable throughout the year. Unboxing the Pure Hot+Cool Link was a familiar experience with the product’s sleek, modern design and magnetic remote that’s curved to perfectly fit atop the unit. Pure Hot+Cool link works together with a dedicated app to help monitor your home’s ideal room temperature while keeping the air in check. It projects a powerful airflow of purified air coupled with either long-range heat or cool air distribution depending on the season. Dyson’s 360-degree Glass HEPA filter does the work, aiming to capture 99.97% of potentially harmful particles (as small as 0.3 microns). These get sucked into the filter so you get the cleanest air possible. Additionally, sensors inside the Pure Hot+Cool link can detect changes in the conditions and then adjust the airflow to maintain target air quality. Jet Focus technology is inspired by the Canada effect, a phenomena in which fast-flowing air follows the direction of the surface it’s flowing over. For concentrated personal heating and cooling, air is released from a jet and accelerated over an airfoil shaped ramp to produce a focused flow of air. For whole room use, a second jet of air joins the first, broadening its angle to produce a wide stream of powerful airflow. There’s auto purification in both heating and cooling mode. In cooling mode, if the air is clean, the A symbol on the front of the unit will turn green and the numerical display will turn off. If it should worsen, the A symbol turns white and the Dyson will start to automatically restart cleaning the room its in. Airflow speed is shown again via the numerical display. When in heating auto mode, the Pure Hot+Cool Link’s both purifying and heating the air, displaying the target room temperature, not fan airflow. Once the target temp’s been reached, it stops heating. 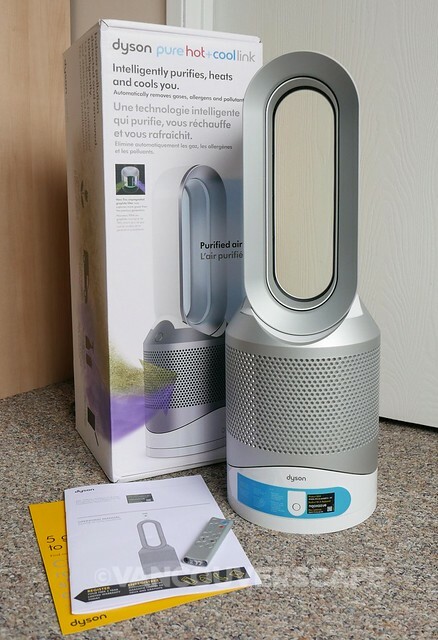 If target air quality is not met, the fan continues to run to keep purifying the air. If the temperature then falls below its target, the machine begins to heat again. Auto mode allows the machine to automatically react to the immediate issue. You can even have the Dyson monitor a specific location outside the home. Either press the remote’s blue or red button for either cooling or heat. The power button will also change to reflect what you’re after (heat or cool). There’s a button on the remote that adjusts airflow speed. Note that the machine needs six days to property calibrate the sensor to ‘learn’ your space. During this period, the machine may be more sensitive to volatile organic compounds, but you can adjust the sensitivity via the app. Via the remote control, set the Pure Hot+Cool Link between one and 10 airflow settings as well as sleep timer intervals from 15 minutes to nine hours. Another option is choosing whether the machine remains still or oscillates. Two additional settings, Diffused and Focused, will adjust the airflow to direct either in wide (Diffused) or narrow (Focused) angles. Want the heat or cooling angle raised? Just tilt the base forward or backward to further customize the airflow. In Night Mode, the Dyson dims the display and runs quietly. If it’s also running in Auto Mode at night, the airflow speed is automatically reduced as well. Being a smart appliance, Dyson’s integrated the Pure Hot+Cool Link with a smart phone app (iOS, Android). Use the app to monitor the inside air quality, even if you’re not home. You can also keep track of your home or condo’s air quality history, which helps to learn about peak pollution times, e.g. pollen season, cooking or cleaning. One thing we did notice is that (at the time of this posting) the app is not compatible with 5G networks. We connected the app with our secondary non-5G network and it paired after the second attempt. When it’s time to replace the filter unit, the machine displays a series of letter F’s with horizontal bars. Dyson programs the machine to remind you to replace the filter after 12 months, based on 12 hours of use a day. If you’re using it in a more polluted space, this notice may come up sooner. There’s step-by-step illustrated directions inside the user manual that will guide you on how to remove and replace it. Dyson products come with a two-year, return anywhere in Canada (with free shipping on both ends) warranty. The Dyson Pure Hot+Cool Link retails for CAD $699.99/USD $499.99 and can be purchased in Black/Nickel (online exclusive), Blue/Iron and White/Silver (these two at retailers across Canada). In the US, find Dyson online and at retailers across the country. 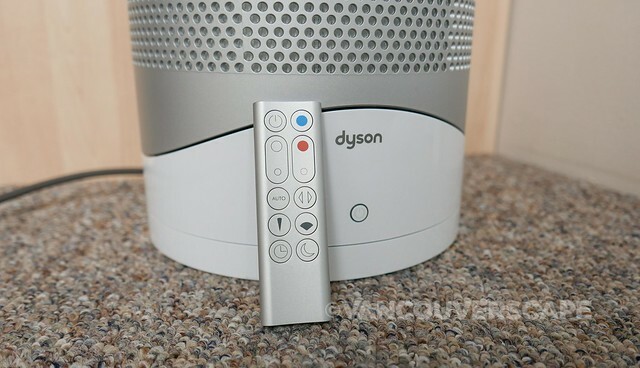 Dyson Canada sent us a Pure Hot+Cool Link to test drive for this feature. Opinions, as always, are our own.